A legend contains information that is necessary to accurately interpret the data on a chart. By default, a chart displays either a vertical axis title if there is a single measure field, or a legend if there are multiple measure fields. Whether you access legend options from the ribbon or the right-click menu, you are presented with the Format Legend dialog box of options. For instructions on how to open this dialog box, see Using Legend Properties. Note: The Fill, Border Style, and Shadows tab are not available in InfoAssist Basic. For instructions on how to open this dialog box, see the procedures in Using Legend Properties. Use the Legend Options tab to customize the appearance of a legend on a chart. The Legend Options tab is shown in the following image. The Legend Options tab contains the following options. Show Legend. Select this option to show a legend on a chart. Clear this option to suppress a legend on a chart. Legend Orientation. Select an option from this drop-down menu to control the orientation of legend markers in the legend area. The available options are Auto, Horizontal, Vertical. Legend Series Start. Use this option to specify the first series to appear in the legend area. Reverse Legend Order. Select this option to specify that the legend be drawn in reverse order. Clear this option to specify that the legend be drawn in normal order. X. Controls the point location of the bottom left corner of the legend. Width. Controls the width of the legend. Y. Controls the point location of the bottom left corner of the legend. Height. Controls the height of the legend. 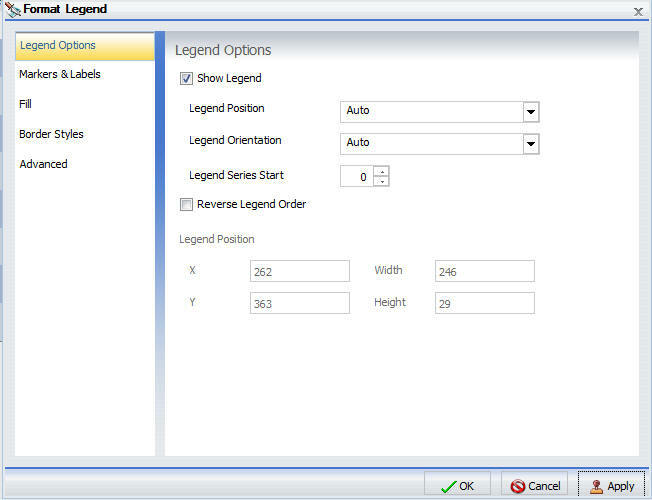 Use the Markers & Labels tab to customize the appearance of markers and labels on legends. The Markers & Labels tab is shown in the following image. Show Beveled Markers. Select this option to show beveled markers. 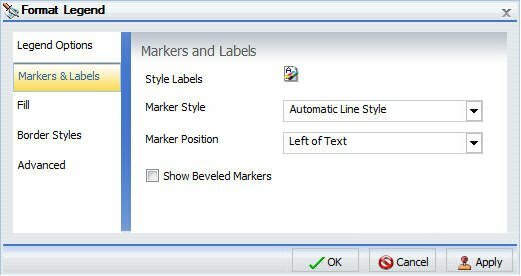 Clear this option to suppress beveled markers. Use the Fill tab to modify the color of the legend area. For more information, see Format Series Dialog Box. Use the Border Styles tab to place a border around a legend. For more information, see Format Series Dialog Box. Show Border. Select this option to place a border around a legend. Color. With the Show Border option selected, you can click this button to open the Color dialog box, where you can select a color for the border. Use the Advanced tab to use square markers and marker shapes on a legend. The Advanced tab is shown in the following image. Square Markers. Select this option to display square markers on a legend. Use Marker Shapes. 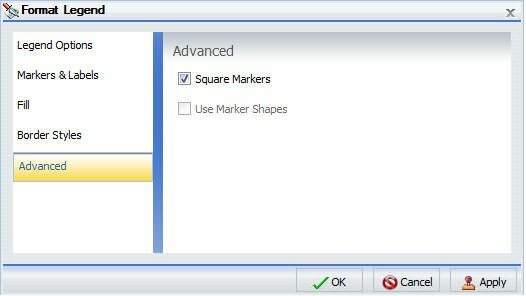 Select this option to display marker shapes on a legend. When you right-click a legend on a chart, a menu of options opens. The menu contains options that are available on the Format tab. If you right-click the background area around the legend, two additional options are available, Legend Area Color, and Legend Border Color. The right-click menu options are described in the following table. The table provides links to the sections of this document in which those options are also discussed. Controls the display of the legend. InfoAssist displays the legend by default. When you clear this option, InfoAssist suppresses the legend. For instructions, see Using Legend Properties. The background right-click menu has an option to restore the legend after it has been suppressed. Controls the placement of the legend on the chart. For instructions see, Using Legend Properties. Controls the orientation of the legend on the chart. For instructions see, Using Legend Properties. Enables you to specify the color of the legend background area using the Color dialog box. This option is available only when you right-click the area around the legend. For instructions see, Using Legend Properties. Enables you to specify the color of the border around the legend background area using the Color dialog box. Opens the Format Legend dialog box. The following sections contain procedures for customizing legend. The procedures are organized by the tab and group in which their associated options appear on the ribbon. Create a chart with multiple measure fields. Ribbon: On the Format tab, in the Labels group, click Legend, then click Show legend to clear the option. Right-Click Menu: Right-click the legend, and clear the Show Legend option. Ribbon: On the Format tab, in the Labels group, click Legend, then point to Legend Position. Right-Click Menu: Right-click the legend, and point to Legend Position. The following image shows a chart with the legend in the default position on the bottom. The following image shows a chart with the legend moved to the right. Ribbon: On the Format tab, in the Labels group, click Legend, then point to Legend Orientation. Right-Click Menu: Right-click the legend, and point to Legend Orientation. Select an orientation for the legend. The following image shows a chart with a legend that has a vertical orientation. Ribbon: On the Format tab, in the Labels group, click Legend, then click More Legend Options. Right-Click Menu: Right-click the legend, and select More Legend Options. The Format Legends dialog box opens. For more information, see Format Legend Dialog Box. On the Fill tab, set the fill, color, and transparency options for the legend background. The legend is formatted accordingly. The following image shows a chart with a legend with a teal background. On the Border Styles tab, select the option to Show Border. Click the Color icon to open the Color dialog box, where you can specify the color of the legend border. Click OK to close the Format Legend dialog box. The legend border is formatted accordingly.